XnView MP is a more polished and much extended version of the original image viewer called XnView. It includes many more features and enhancements compared to its little brother. One of the main improvements of XnView MP over the original is its new support for multiple cores of your processor in both 32-bit and 64-bit versions. That means the program should complete tasks faster and have less of an effect on system performance. Version 0.93.1 is a freeware program which does not have restrictions and it's free so it doesn't cost anything. For security reasons, you should also check out the XnView MP download at LO4D.com which includes virus and malware tests. Additional screenshots of this application download may be available, too. Comprehensive listing of image viewing applications for use on the Windows OS. Download links are provided for free, along with editor reviews of the best programs available. 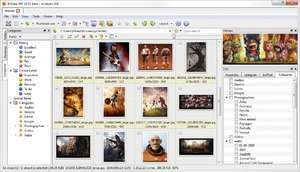 Check out some of the freeware downloads available in the picture viewer category. They contain no strings and are available at zero cost. 4.5 out of 5 based on 60 ratings. XnView MP download been highly rated by our users.